The genus Genlisea, together with the genus Utricularia and Pinguicula, belong to the family of the Lentibulariaceae. There are approximately 22 species of this carnivorous plant genus, which can be found in Africa and South America. In the past few years, a variety of new species have been discovered there. Genlisea grows on very wet peat-like and sandy soils and is found on strips of land and transition areas between lad and water. These carnivorous plants are easy to grow if they are placed in the shade and are best cultivated in peat, sphagnum or a mix of sand. 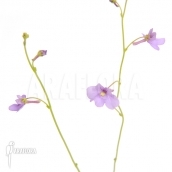 Please find below the Araflora productinfo and Araflora plantcare sheets for additional information about the cultivation and care of this carnivorous plant as well as the exotic plants Araflora is offering in this category. Are you looking for a specific species of carnivorous plant? Click to open the Araflora plantfinder.